Hello Everyone and Happy Saturday!!!!! Yesterday was my 51st birthday. I want to thank you all for your good wishes for the day. I did indeed have a fabulous day! Thank you all so very much. I went antiquing and found a few treasure, among them, this pair of Vintage "pearl" ear bobs! They have aged beautifully, and the rhinestone rondells are gorgeous! They will be in the flower gift box for the giveaway. I was going to make a pair, but I thought these were precious and a good choice. Thank you also for all of you who have entered so far in my Giveaway. I will pick the winners on Sunday evening. It is not too late to enter! In the post below you will see I am giving away a paper pack, a flower gift box (earrings inside) and a kit to make 2 crepe paper flowers! So there will be three winners. One winner for each item. My art room has taken the ususal turn of getting quite messy. So today I am enjoying sorting and organizing....again..... But, I am totally thankful that I have all this "stuff" that I need to take care of. I find "stuff" inspiring...do you? I hope you had a wonderful birthday. It's fun to clean up an artroom and find things again! Enjoy your day. These are so gorgeous. I'll have to sleep with my fingers crossed! Happy Happy Happy Birhday, sounds like the perfect day! Sounds like you had a beautiful day. The pearls are gorgeous. I can't believe your art room would ever be messy. Well. a very Hapy Belated Natal Anniversary to you!! Hope your birthday weekend if a wonderful continuation of your very special day! Pearls.....made of angels tears..I love them and this pair is beautiful. Happy happy birthday sweet Terri!! I hope you enjoyed it and I hope all of your dreams come true!!! Hi Terri, great to hear that you had such a wonderful birthday! Antiquing sounds like a perfect activity for such a day. Even better that you found some treasures! I would love to be included in your beautiful giveaway!! Love the pearl earrings. Thank you for coming over and visiting my blog clear back in February! Talk about prosrastination on my part, getting over to visit your blog (which I am in LOVE with by the way!) You are so very creative, and all the colors are so lovely, what a treat for the eyes! Happy belated Birthday...hope you did something marvelous to celebrate your special day! Looking forward to getting to know you better! Your blog is so full of scrumptious things. You have the artist's eye for beauty. Thanks so much for your kind comments on my blog. Yes, messing about with digital and mixed media is much more like play than work! Great to hear you had a wonderful birthday and you got to do some shopping. These earrings are just gorgeous, they look like they are in excellent condition too. By the way - did you hear that all the entrants in the giveaway had dropped out and tht I'm the only one left participating? Happy Birthday Teri!! What a fun way to spend it!! Ohh these are just beautiful!! 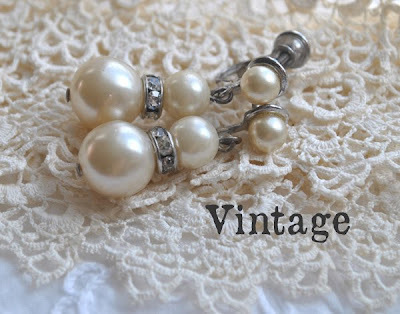 There is nothing quite like vintage pearls... how can you bear to part with them?? Yes agree those rhondelles are superb!